I have a love and hate relationship with woodpeckers. They are sometimes lovely and can be ultra annoying too. Woodpeckers are known by all birders for tapping (‘pecker’) on tree trunks in order to find insects living in the inner portions of the tree or its barks. They are also notorious for excavating nest cavities. One good thing about woodpeckers is that they primarily feed on insects, along with fruit, acorns and nuts. This means that there is less stress on finding food or planning their diet. The only thing left will be to decide the best woodpecker feeder so they will continue to come and add colors to your yard. Depending on your location, woodpeckers are found in wooded areas all over the world. Well, except forests in the southern hemisphere like Australia. The main features of woodpeckers are its strong, pointed beak and very long tongue. Their beak acts as a chisel to open barks of trees while their tongues has a strong glue-like strength to catch insects. Amazingly, woodpeckers can tap an estimate of 8,000-12,000 times per day, without effect on their beaks. During their tapping frenzy, the feathers in their nostrils keep them from inhaling the particles from the tree bark. While the strong black, white, and red combs of a woodpecker bird are good to look at, their ‘pecking’ behavior can be a real issue. This is especially true during the mating season (around spring) and would stop during the nesting season (around summer). The louder sound is used to attract their mates. Still, some people like to see woodpeckers around. 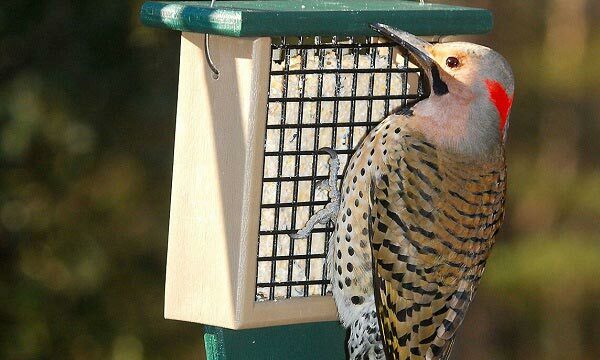 For those who are following this trend, here are suggestions for the top 10 woodpecker feeders to make those peckers happy and come back for more. One of the most beautiful feature of this feeder is its simplicity yet practicality. Birds Choice clearly did well designing a feeder that is perfect for woodpeckers and other suet-based birds. The only worry is when the suet block becomes tiny, then the birds might have a hard time finishing it off. Too small size means falling off to the ground eventually. While ground feeders can enjoy the scraps, it might cause a mess in the yard. During feeding, the peckers can cling to or perch a little on the metal covering of the suet. 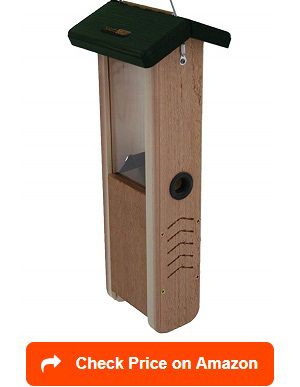 Priced mid-range, I am not surprised at how popular this feeder can be to the birds. Still, the tendency of predators coming over to claim the suet is high so hanging it up high and away from branches, ledges and poles will surely drive the squirrels away. Housing a bird in a house-looking feeder is not just cute — it is welcoming! Birds should be given that special treatment since they just don’t come to feed on your treats but also provides happiness to bird watchers. The double suet bird feeder by Stokes Select shows that level of ‘welcome’ with its simple yet very sleek design, attracting clinging birds such as woodpeckers. The small house design is of highest quality with its anti-rust system, power coated metal, rain protectant roof and double lock enclosure. With such features, it sure is squirrel proof too! 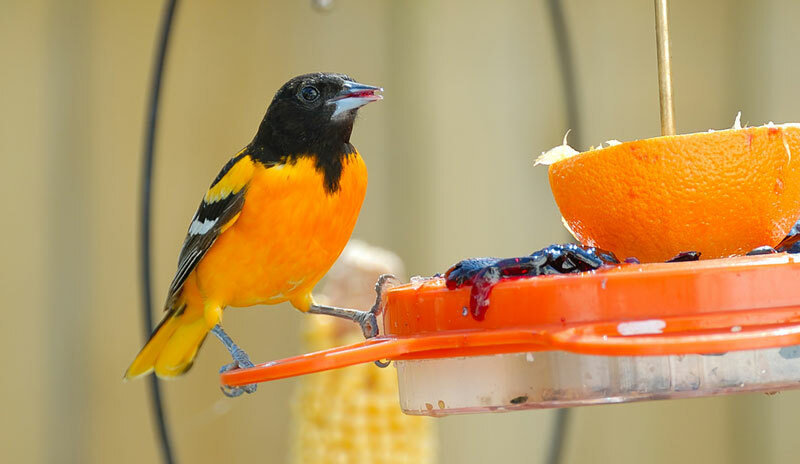 I like the double-sided suet cake container because it allows multiple birds to come and enjoy the food at once. They are also fascinating to watch as they all fight for food, or for space to cling to. The birds typically come in droves during the early spring so hanging this double suet feeder at a place noticeable to birds will bring in more varieties of birds. 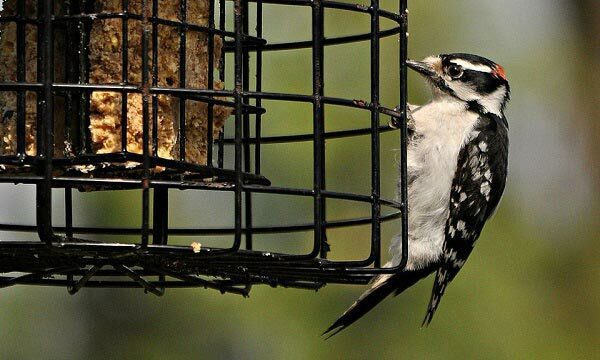 But suet cakes are woodpeckers favorite so having it in place will surely let you see that strong, pecking but adorable feathery friend around. 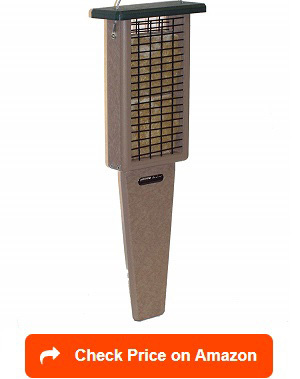 Priced way lower than most feeders, this is definitely a great find – quality and durability all considered. No wonder birders have rated it the high 5 and recommends it to be the best woodpecker suet feeder. The feeder is perfect except of course if you live near wooded areas so you might expect a lot of flying friends. That case, the 5.25 x 5.25 size may not be enough. Getting one or two more of the same design will however put you at ease. Do you like seeing birds doing acrobats while eating? Then getting the cedar suet feeder of Nature’s Way will provide you just that – the woodpeckers in action. The feeder allows birds to eat from the bottom, pecking on the big slab of suet inside it. 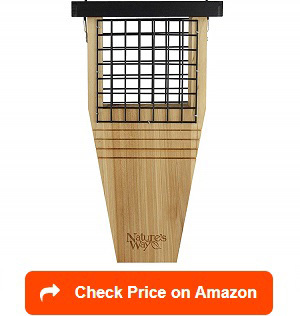 Made from a premium piece of cedar wood, proven to be rot and insect resistant, this beautifully designed feeder attracts birds addicted to suet, including woodpeckers. What I like about this feeder is that design limits the kind of birds that can come. There are pros and cons to this design. For one, only birds that can eat upside down such as nuthatches and woodpeckers can feast on the suet, while the rest has to find another feeder to eat from. The cons, however, can be extremely annoying. Since they eat upside down, the feeder can tilt quite unbalanced which can cause damage to the feeder itself. Infact, some expert birders have complained about the roof detaching from its body –perhaps because of the weight of the birds. Still, even with a little movement, the birds are comfortable clinging to the metal floor all throughout. Still, it is great to note that when it comes to aesthetic, this design can technically win it all. Seeing the bid eating upside down, and coming back for more each day means that you will never run out of a bird show. While suet is probably a good treat for woodpeckers, they can also feed on sunflower seeds and peanuts. 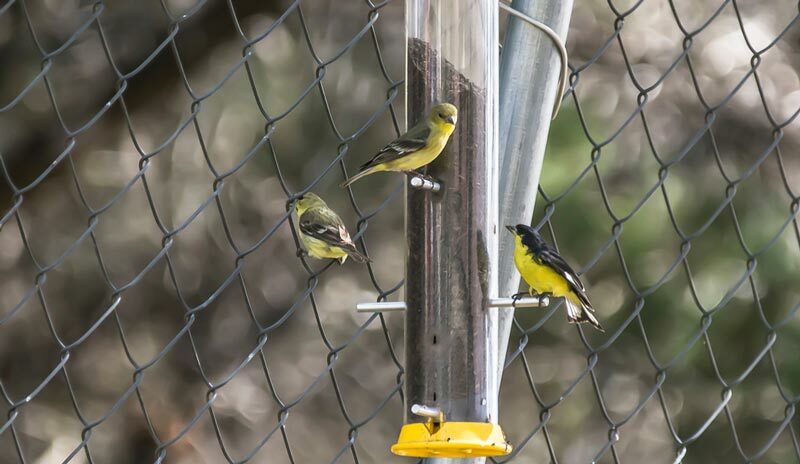 A feeder that serves these treat means they can attract more varieties of birds. This is what GrayBunny Steel feeder exactly does. A cylindrical shaped feeder that allows peckers to peck, 360 degrees with other birds. What is practical about this feeder is the fact that it is good for shelled peanuts and dried fruit mixes, eaten through the wire mesh. I like the size of this feeder, 15 inches, from top to bottom, which means that it can accommodate few woodpeckers at a time. Because it is round, the seeds are distributed more evenly. This is the reason why seasoned birders are happy with the result – increased in the number of feathered guests because of the variety of seeds to choose from. What more? The wire mesh makes sure that squirrels and rodents are out of the feeder so there is no need to worry about them stealing the seeds. A good feeding time for the birds are expected, and a happier bird watcher too! The only downside of this feeder is probably the frequency of refills. Although the top can be removed for filling easily, it will still be great not to refill as frequent. As a solution, hanging several of this Sundflower seed feeder by GrayBunny in your yard might save you the time. 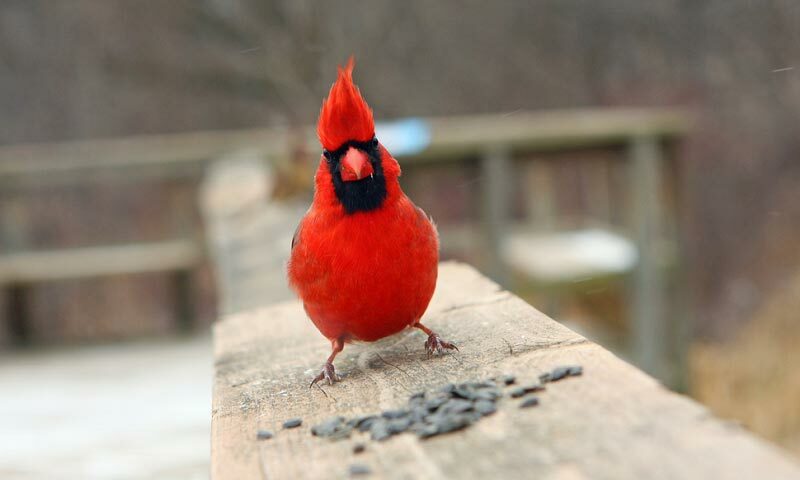 Giving the birds a comfortable feeding time is a must if you intend to have them back on your yard regularly. That means giving them a feeder that takes care of all of their parts, including their tail. I like that Birds Choice suet feeder is exactly that. It provides a good space to hold two-suet for the woodpeckers to enjoy and an extra long tail prop to rest while eating. Now, that’s plenty of pampering. Woodpecker lovers know that they have three points of contact to the feeder when they eat: their beak for the food, their feet for clinging and their long tail to rest. Without a tail prop, they will have a hard time eating, with their tail swaying. 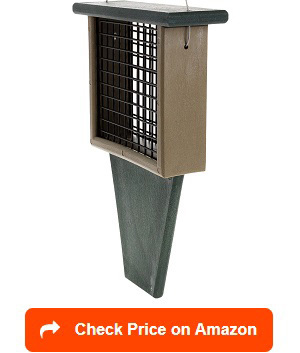 Personally, I recommend this feeder because of three reasons: it has a very practical design—obviously the tail prop is a plus, it is squirrel proof as the metal casing for suet is quite sturdy, and the fact that it is made of recycled materials. All three supports the natural way of things so getting it at home, for your birds, will all be worth it. Of course, even if it looks perfect, there is a catch to the feeder. 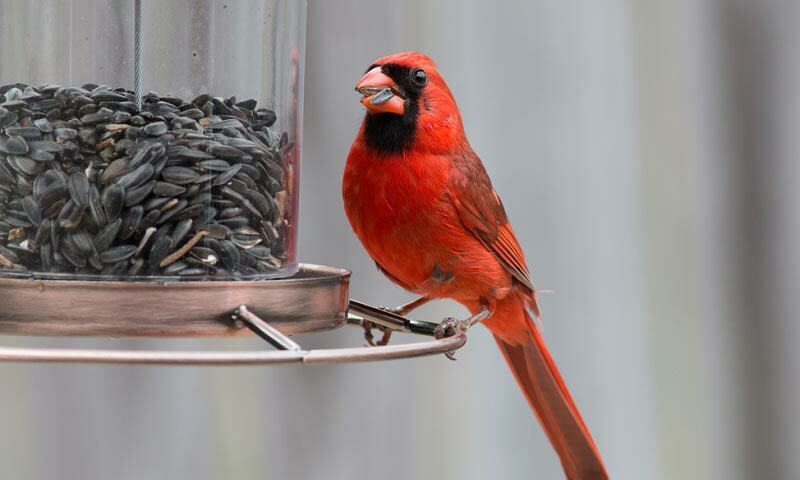 If a heavier bird comes in, then the plastic feeder sways causing discomfort to both the bird and the bird watcher. It can also swing like a pendulum when the wind is very strong. I consider this a special feeder. And Songbird Essentials is on its way of attracting great varieties of birds using its wide and long tail prop features. The green colored feeder is reflecting the natural environment attracting a variety of birds in the process. 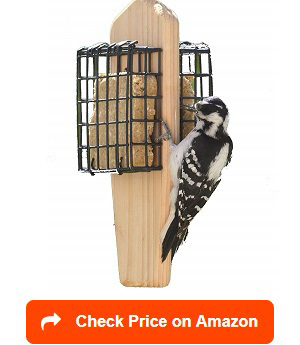 While other feeders (see above) is intended for leaner or smaller birds, this suet feeder is perfect for bigger-sized woodpeckers or any other suet-feeding birds. Not only that, the feeder, which is made from recycled plastic milk jugs is environmentally friendly and is expected to last more than a hundred years – no peeling, fading, rotting, cracking, chipping, or warping. I recommend this product if you live in an area near the woods because it means you might have more varieties of birds or that you can actually welcome bigger feathery guests in your suet. The only downside is when you get raccoons in the area, then putting this suet in locations they can reach will defy the purpose of bird feeding. The raccoons are not only nasty creatures for stealing the suet but they are also up to permanently damage the feeder. Finding a balance of functionality and affordability? The cedar suet cake of Nature’s Way is an example. I like this product for those very same reasons. Among the feeder materials, I really like the use of cedar wood. It is not just attractive but it is also very durable. The birds can also be more attracted to more ‘natural’ materials than plastic ones. The tail prop, a big hit among woodpeckers is a plus. They are very bottom birds hence there is a need to prop their tails for balance. Without leveraging their tail against a wood, or a plastic tail prop, they won’t be comfortable feeding so they might just fly away. This is exactly why I think the 8.5” additional tail prop design of Nature’s way makes this feeder one of the high quality woodpecker feeders available. 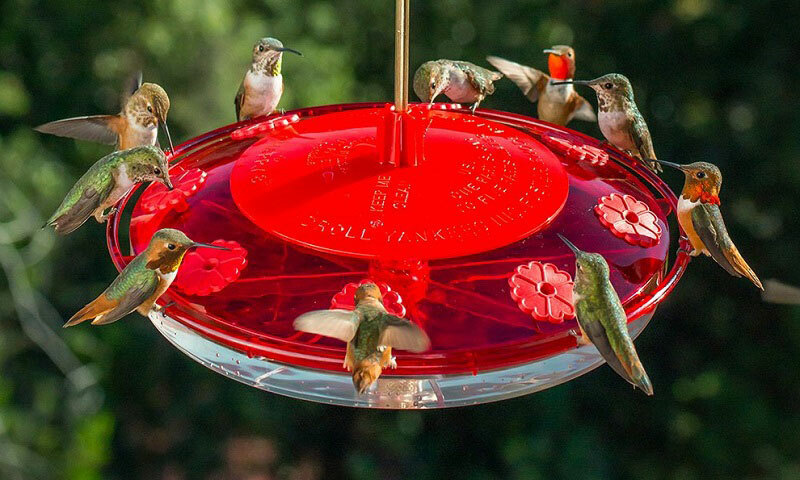 So far, expert birders gave this feeder a five thumbs up simply because it is an attractive addition to the backyard as well as its durability. 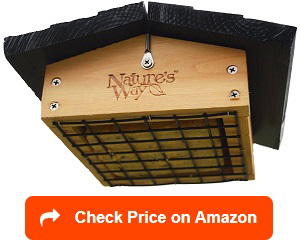 Personally, this cedar suet feeder by Nature’s Way is highly recommended. Still, like any other feeder, keeping it away from possible entrance of squirrels should be observed. A smart squirrel can lift up the top portion and get a share of the delicious bird suet. Hang it far from ledges, windowsills or tree branches. Another downside is that it can only hold one suet cake, so refilling regularly can be troublesome. Beautifully designed. This best describes the Cedar Single Cake Tail Prop feeder by Kettle Morraine. It is stylish so it will surely add value to your garden. I really love the wide tail prop, which gives the woodpeckers enough space to rest their tail during feeding time. And because woodpeckers love the forest, the use of cedar is great in attracting them to your yard. I love suet cakes because it is limiting the birds that like it. This means that I get to choose the birds I wish to feed, nurture and watch in my garden. Suet cakes are very effective in attracting many kinds of birds. Still, a lot of bird watchers recommend this product to those who intend to see birds; woodpeckers for example, eat comfortably. Because the product is made of cedar wood, it is very sturdy. There are no nails or staples that can be very annoying as they fall off easily. It is well screwed so I know it will last for longer. Perhaps, the only downside of this product will be the fact that it sways a lot when the wind is strong. Other than that, the feeder will last for a long long time. As much as possible, we wish to see the birds from the comfort of our windows. This is for us to watch them while sipping hot coco on a cold day or a smoothie on a hot day. So putting a feeder on your clear window is the best choice. 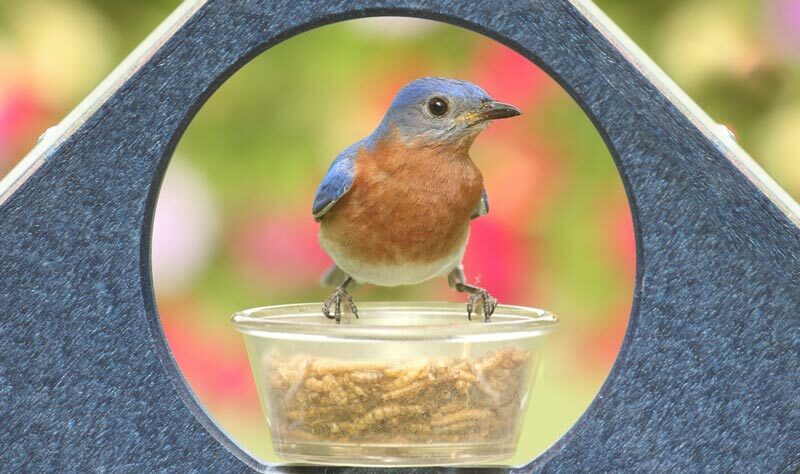 There are many benefits of putting window feeders: human movements or activities won’t disturb uninterrupted view of the birds, the birds and it is easier to monitor since the feeder is within reach. For woodpeckers, this is special. And Kettle Moraine made it so through their window single suet cake feeder. I like this product for many reasons: it is within reasonable price, it is easy to prepare as it has a very strong suction, and it is small and light. It is no wonder why a lot of bird watchers who have tried it raved about its practicality. Aside from the downside of having only one suet, and when such suet is being eaten, some gets stuck on the window. For birders who live on a second floor or even buildings, this window feeder is a better choice. You can even pair it with other window feeder and see the birds all come and play from up high. There is always something about recycled materials that makes it much more appealing than any other feeder. For woodpeckers, it will be great to present them a feeder that only feeds them. As a birder, I can attest that there are many things about this woodpecker feeder that is great not only for birds but for the bird watchers as well. 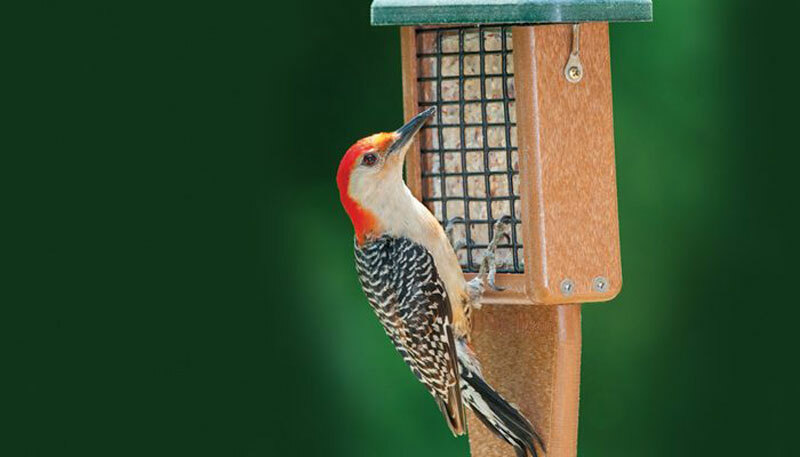 The material is made of poly lumber, all screwed construction using steel screws, rust resistant aluminum, routed edges and removable seed diverter – all features making it sturdy, aesthetically appealing and an ultimate feeder. In fact, out of all the woodpecker feeders available, this is probably my favorite. And there is a valid reason for that: it’s designed well and its clear plexy panel allows me to see the level of seeds or nuts. This means that I do not need to waste my time guessing when to refill – a task that becomes harder especially during the cold weather. 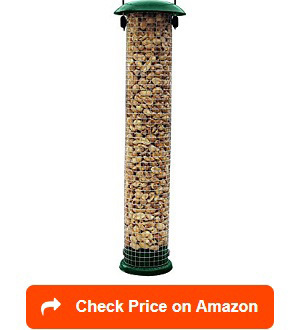 While I love the feeder, it may need a little modification especially the roof portion. The hinges on top can be a problem during rainy season. Water drips through the spaces in the roof. Overall, the product is of high quality so no wonder the price is also on the top band of expensive ones. But if you have obsession with woodpeckers, every dollar is worth it though. A woodpecker feeder is specially designed to attract the ‘peckers’ to come to your yard. Woodpeckers are beneficial to the environment – eating insects and garden pests –takes away the problems associated with destroying the gardens. Most woodpecker feeders are carrying suet as the main food. 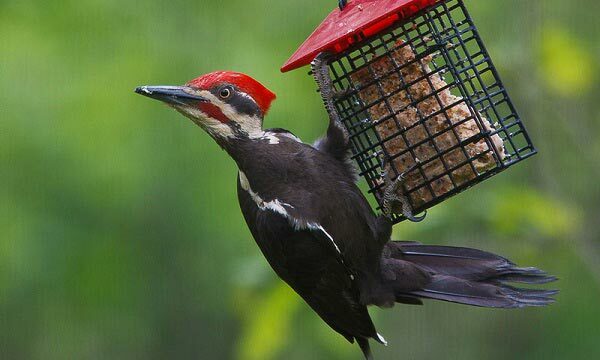 Without a doubt, woodpeckers favors suet among many other foods. Although they are ready to feast on flies, spiders, beetles, wasps and grubs too! Woodpecker feeder are better if they have a metal, which they can use for clinging. When they do that, you will enjoy the beauty of bird watching all the more. Some woodpecker feeders carry seeds, usually enclosed in a wired mesh and sometimes they get to share it with other variety of birds. In that case, you might get treated to a colorful display of feathers, all in a feeder. Finding the right woodpecker feeder can be a challenge. But there are many choices available in pet shops. There are of course tried and tested feeders you can simply get to make sure that they will all come visit your yard. Suet basket. This is keeping things simple. It also means inexpensive. And when I say simple, I am referring to a square metal basket (or a cage) to put a suet cake. Larger opening of the metal holder means faster feeding time for the woodpeckers. They also use the same metal to cling onto while eating. 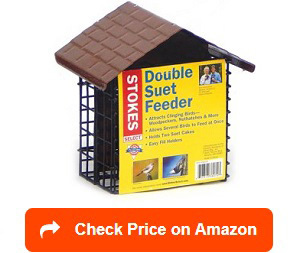 Check Stokes Select for a little upgraded version of this feeder. Suet cake holders with Tail Prop. Yes, that means a little pampering – to rest the woodpecker’s tail to ensure that the bird gets the best of the feeding experience. 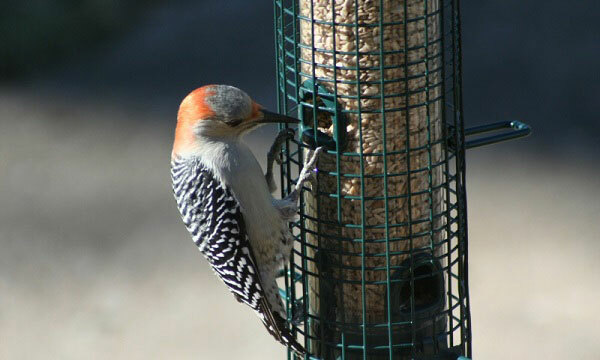 Bird watchers attest that the peckers visit most feeders with this design more frequently. For a similar product, check our Birds Choice 2 cake suet feeder product line. Suet balls. A variation of the cake version is the suet balls. They can be placed securely in a cylindrical container with metal mesh and hanged outside for the woodpeckers to enjoy. 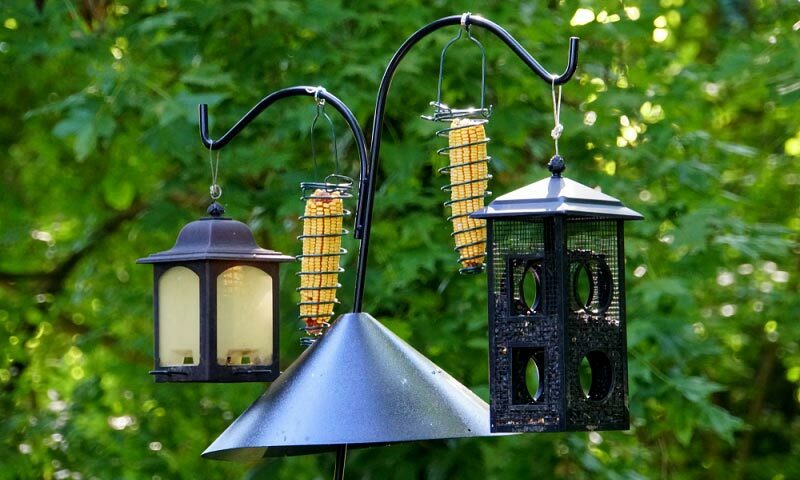 When buying this design, make sure that the spaces of the mesh or wires are large enough for the woodpeckers to eat in comfort. Alternatively, feeders with smaller spaces can be filled with suet nuggets. As you become more familiar with bird diet, you will have more chance to create your own woodpecker food recipes. Suet Cylinder Feeder. This type of feeder can actually be used for other purposes such as nuts and suet combined. This simple design will allow multiple birds pecking on the suet at the same time. Try GrayBunny Suet Feeder to attract birds using cylinders. Definitely, there are choices ranges from simple one to super complicated ones. Generally, the hanging suet feeders are still the most favorable for woodpeckers. Whether the birds get attracted to more expensive or cheaper feeder is not clear so do not go panic buying for the priciest one. Instead, you need to consider functionality, durability and practicality of the feeder. Depending on where you are, near wooded area or far from it, the influx of woodpeckers to your yard will be different. 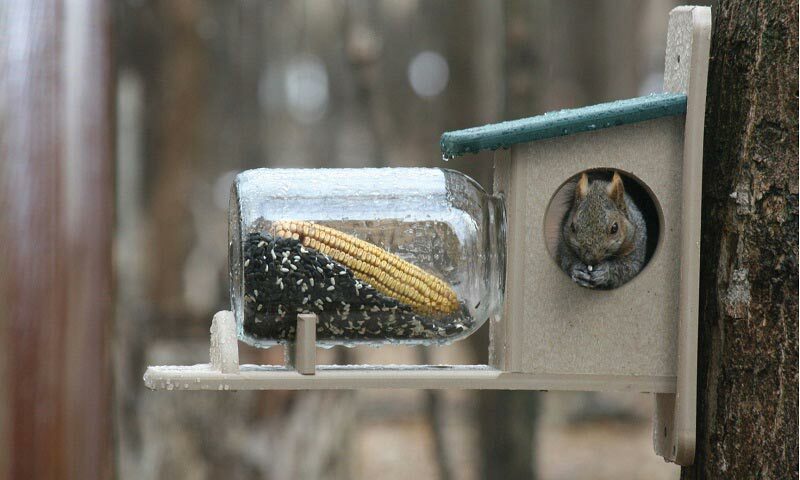 So, this aspect should be a consideration when buying a woodpecker feeder. Capacity. Whether you intend to buy a suet cake, suet plugs, suet peanuts or anything else, you need to consider how much the feeder can hold. You do not wish to have any problem with feeders falling apart because of weight. Maintenance. No matter how much you love birds, you will never have the time to refill it, clean it, change it regularly. So, depending on your schedule, you can go for an easy to maintain one (for example, simple suet basket) to more complicated designs. Accessibility. 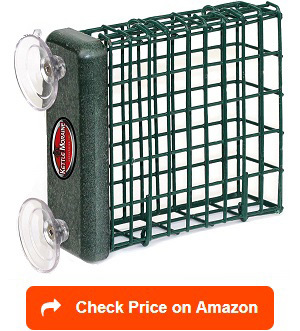 Most suet feeders have metal enclosure. That’s great. Just need to double check that the metal enclosure has enough space for the birds to insert their beaks and eat comfortably. Durability. Since you can’t afford to lose the regular birds coming to you, make sure the feeder will last a long time. Go for rust proof, metals and high grade materials. Tail Prop. This is a bonus one you can give the woodpecker. Getting a feeder that has enough space to prop their tail means you can enjoy more time watching them slowly eat the treats. In addition to getting that perfect woodpecker feeder, perhaps you can consider planting trees such as an oak tree and pine tree as woodpeckers love acorns, pine seeds and sap. Planting trees provides the woodpecker shelter plus natural food that will keep them healthy. As an alternative to trees, short-term plants to keep the woodpecker around will be berries, fruit producing bush, and apple. When and where to hang woodpecker feeders? Near window. It is always great to put them near window as you will have a clearer view of the birds in action. Protecting birds is the first priority so putting the suet feeder within three feet of a window will help. Since suet blocks are big enough to be seen, putting them closer to the window (with enough distance) will ensure that they won’t fly through the window and hurt themselves. Tree branches. Birds are birds for a reason – they live in the woods, trees and sometimes where the flowers are. Hanging suet feeders on trees or bush branches can be a great idea. When doing so, providing a birdbath nearby will make them happier. 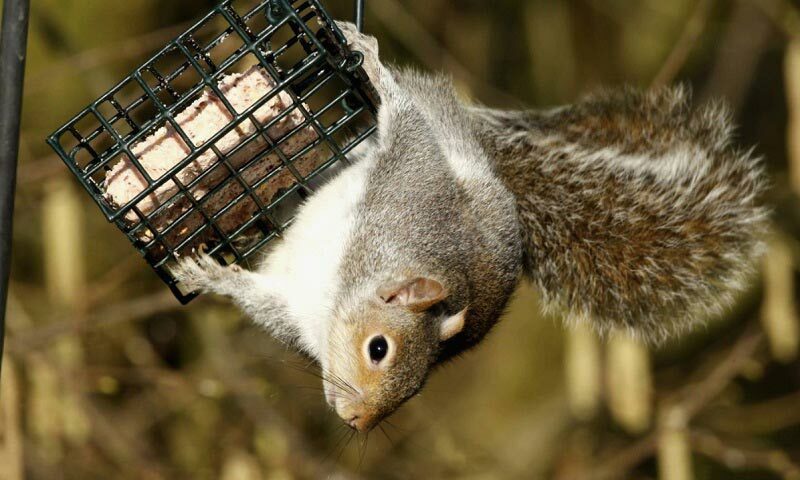 Hanging the suet outside, however, means that it should be far or high enough for squirrels not to damage anything. Patio. Watching the woodpeckers up close is a fascinating experience. Hanging it on your patio will give you that edge of watching them peck, feed and rest their tail on the tail prop. The only problem with patios is the possibility of rodents and squirrels reaching the feeder. No matter which part of the house you hang it, just make sure that it is placed as far away from predators as possible. Some birds eat suet too and that’s okay, you will probably have more than woodpeckers in your backyard. How to attract woodpeckers in your backyard? Without a doubt, woodpeckers are beautiful bird species found in North America and many parts of Europe. They eat large amounts of insects and tend to stay in one area for a good part of the year, which means that attracting them to your yard could be actually easy. There are few things to consider when attracting a woodpecker, but every birder may have a slightly different experience. The woodpecker variety. There are different varieties of woodpecker depending on your location. Knowing them will help you determine which food you should prepare and which feeder you should hang to attract them over. Hairy woodpecker is checked with black and white, commonly found in North America. They do not however eat from feeders so sprinkling few suet on the ground may actually help them come. The North flicker is a polka dot woodpecker found all over the Americas. They tend to feed on insects so putting your suet feeder near bushes might attract them to come and add colors to your backyard. Pileated, Reh-headed, and Red Bellied woodpeckers are large crow-sized birds with a red crest. They eat fruit, seeds, nuts and other small birds and even small rodents. They also eat in suet and nut feeders so hanging some in a place they can see when they fly by will be a great idea to keep them coming. European woodpeckers are usually in small towns and villages. These birds are a variety of the Picidae bird family. They eat insects and saps so hanging your feeder near sources of these food might be helpful. The right feed. Generally, woodpeckers love nuts, seeds and are attracted to feeders, either seeds or suet. Suets are hard fat from animals and well-loved by woodpeckers but since it is fatty so feeding them suet during the summer might not be a good idea. Fruits are attractive to woodpeckers as well. Oranges and apples are loved by woodpeckers are very cheap option to suet cakes. Nuts and seeds. Some woodpeckers like feeding on nuts and seeds so it will be great to have some few choices in your backyard. The right feeder. Knowing the right feeder will make the birds come or go. Next to kind of feeder, location is the next thing. Most of the time, upright feeders is attractive and gives more action. However, feeders that has tail props can be provided for a peaceful and restful feeding time. Water. Most woodpeckers love to visit baths to for drinking and bathing usually closer to the ground. However, during winter months, be very careful about ice forming in water baths. You can use a plastic bowl sent out everyday instead. What is the best food for woodpeckers? A lot of woodpeckers like a variety of food. Some of the woodpeckers eat suet non-stop or a combination of both. This is what you get with this peanut delight feeds by C&S. The combination of soft dough texture pressed into cake is probably the best treat you can give your birds. Aside from the texture, this feed is nutritionally balanced so it provides wild birds with the needed energy. 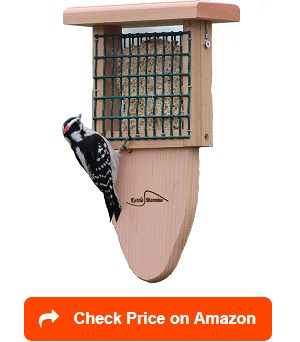 Surely, the woodpeckers love it but so are the cardinals, which means putting this treat out will give you the advantage of watching different varieties of birds in the confine of your own yard. How to make a suet feeder for a woodpecker? A mix of birdseed or other goodies to be mixed with the suet. Approximate the content based on the amount of fat. The procedure is fairly simple as you only need to mix all ingredients together evenly, refrigerate for one hour or until hardened and place it in your bird feeder or hang it on a tree. Like most birds, woodpeckers have their own demands for better living spaces or feeding stations. They are attracted to bushes, nice feeders, or the ability to hide. They also like to eat peacefully and privately so making sure that there are designated spaces for them to fly around and away from possible predators are ideal and will probably make them come back on a regular basis.